Think of Anzhi Makhachkala and the first thing that comes to mind will probably be Samuel Eto’o. The Cameroonian striker was the marquee signing of the gas-rich club from Dagestan, Russia and he is reported to be the highest earning football on £350,000 per week. The former Barcelona man had a strong first season in Russia, scoring 13 goals in 22 league appearances as Anzhi qualified for the Europa League. However, as Liverpool approach this must-win group game on Thursday, they should also take note of Anzhi’s other African striker who is making waves in the East; Lacina Traore. Once you’ve seen Traore in action, he is not the sort of player you easily forget. Standing at 6 feet 8 inches, the 22-year-old has been labelled the ‘Ivorian Peter Crouch’. Like the Stoke striker, he has a strong goal-scoring record and is known for his surprisingly skilful and gracious performances, despite his spindly frame. Traore is a product of the famous Ivorian ASEC Mimosas academy that had nurtured such talents as Yaya Toure, Salamon Kalou and Gervinho. Having completed his footballing education in the Ivory Coast at his hometown club Stade d’Abijan, Traore moved to CFR Cluj of Romania. Cluj’s forays into Europe gave the world their first glimpse of the towering centre-forward. Traore was not just a novelty act, he had talent too. Look no further than his second goal against FC Copenhagen in the 2009-2010 Europa League – it was a thing of beauty. More goals followed as Cluj competed in the Champions League the following season and it was not long before Traore’s name was being linked with the likes of Arsenal and Liverpool. Instead, Traore moved further east to Russian side Kuban Krasnodor, then managed by former Romania and Chelsea star Dan Petrescu. He enjoyed an excellent debut year in Russian football, scoring 18 league goals and was named in the Russian Football Union’s list of the 33 best players in the League. 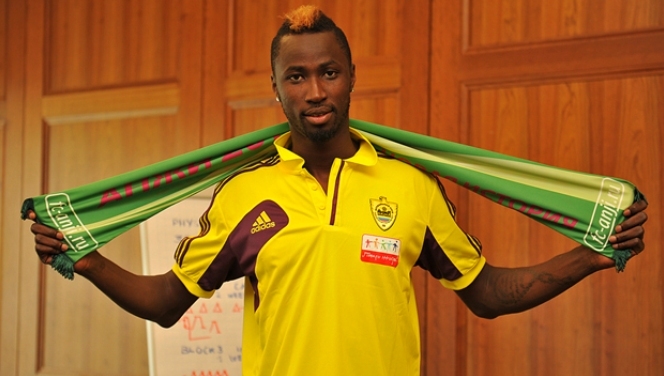 A big money move beckoned and in June 2012, Traore signed for Anzhi for an estimated fee of €18 million. His impressive run of form has continued at his new club, and so far he has scored 9 goals in 15 games, in all competitions. Traore and Eto’o have quickly formed a dangerous partnership that has catapulted Anzhi to the top of the Russian Premier League. The pair gave the textbook performance for a striking duo last month against Volga Nizhny, grabbing a goal and an assist each as Anzhi won 2-1. Traore comes into the fixture with 3 goals in his last 3 league games, including this blistering strike against Alania Vladikavkaz. This entry was posted in Previews and tagged anfield, antonio di natale, Anzhi Makhachkala, dagestan, europa league, lacina traore, liverpool, russia, russian premier league, samuel eto'o, thursday night, udinese by Hugo Greenhalgh. Bookmark the permalink.